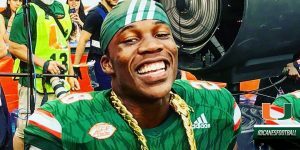 The number 7 ranked Miami Hurricanes trounced the Number 2 ranked Notre Dame Fighting Irish 41-8 at Hard Rock Stadium! On Saturday, November 11th, the 7th ranked Canes obliterated Notre Dame to make the Ranking Committee know they deserve to be discussed as a playoff team. Passing & Receiving// Starting QB Malik Rosier threw for 137 yards a touchdown. Lawrence Cager led the Canes receiving with 45 yards, Christopher Herndon IV added 30 yards, and Braxton Berrios added 10 yards with a Touchdown. Rushing //Travis Homer rushed for 146 yards on 18 carries. DeeJay Dallas added 53 yards and 2 Touchdowns on 12 attempts; Malik Rosier also added 44 yards on nine carries. Defense // Miami’s defense did an exemplary job stopping Notre Dame’s rushing attack that averaged over 300 yards a game. They held Heisman hopeful Josh Adams to 40 yards, and Notre Dame as a team to 109 on the ground. In the air, the defense stopped both Quarterbacks causing five sacks, a fumble and three interceptions, including a 65 interception for a touchdown by Trajan Bandy. Turnover Chain Szn// After a speech on the U at midfield by Notre Dame’s coach about hating the turnover chain. 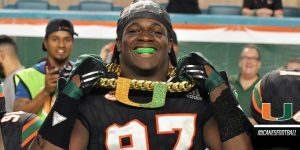 Miami brought out the chain four times. Special Teams// Michael Badgley was 2/3 on field goal attempts and 5/5 on extra point attempts. Notes// This week, Miami should see their ranking rise anywhere from 1-4 and also will be the center of questions if the U is back. Miami has clinched the ACC Coastal Division title and will play Clemson in the ACC championship on December 2nd in North Carolina. This week the Canes will take on UVA on Saturday at 12 at Hard Rock Stadium!